As would be the case with a person that is nearly 200 years old, the buildings at Towerwater have many stories to tell. To hear the story of a building, you need to be patient and listen attentively. One of the stories of Towerwater is captured on the kitchen door. The door is of a stable-door design. Over the many years of its existence, it has been coated in layers and layers of paint. One weekend, Keith’s sister, Cheryl and brother-in-law, Anton came to visit. During the visit, Anton was curious about an external protrusion on the top-half of the door. Having taken it for a knot in the wood we had never given it much thought. 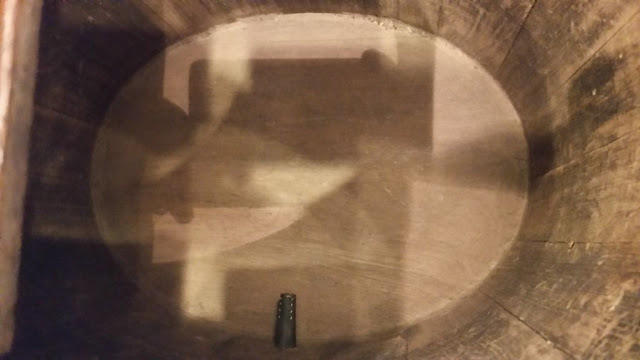 Anton observed however that the shape was specific and that there was no matching shape on the inside. With Keith’s interest piqued, the paint was promptly removed over the shape. 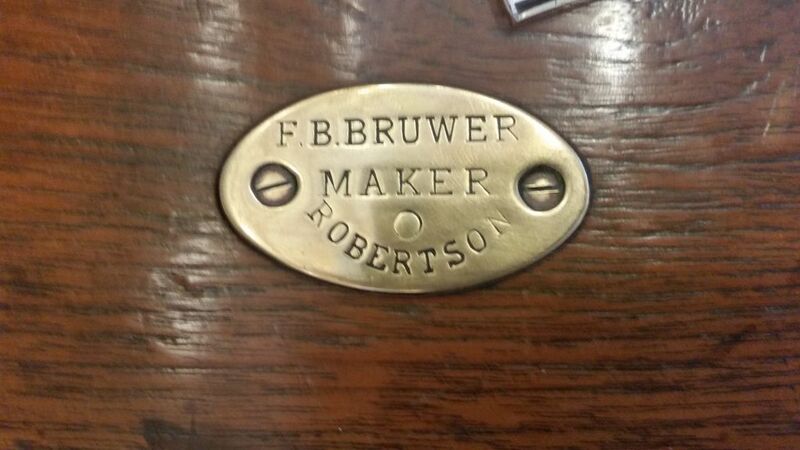 An oval brass plaque was revealed impressed with the wording “FB Bruwer Maker”. The immediate questions that were raised were; who was FB Bruwer? What did he make? And, why was his plaque tacked to the door? We have some friends named Bruwer in the valley. We know that Bruwer is a very old family name in the farming community, with the Klipdrift farm probably being the most famous of all the Bruwer farms. The brass plaque was left on the door as part of the historical artefacts of Towerwater. For years it remained a topic of discussion and speculation. The answer, as with all the other stories of the house, we trusted would be revealed one day. We just had to be patient. After we restored the hearth, Keith began searching for an antique ‘waterbalie’ (water barrel). He wanted to place it next to the hearth. 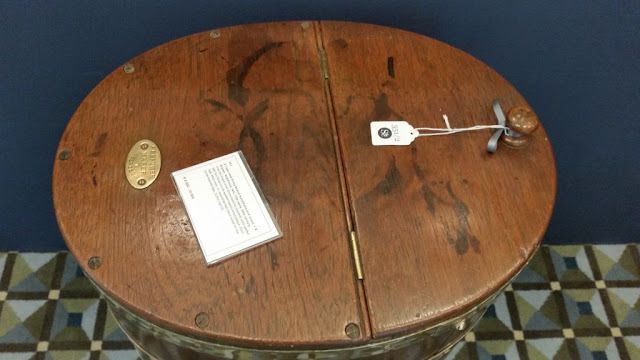 Searching for a ‘waterbalie’, it became one of the items that would draw Keith’s attention whenever we noticed one in an antique shop. Recently, browsing through the auction catalogue of Strauss and Co. for their October 2016 auction in Cape Town, lot number 351 took me by surprise. The description read, “A Cape teak brass-bound ‘waterbalie’ and stand, F B Bruwer, Robertson, late 19th/early 20th century”. There it was. After nearly 25 years I saw another reference to F B Bruwer. This time we knew what he had made. He was a cooper from Robertson. It was as though the universe had contrived that it should be a ‘waterbalie’. 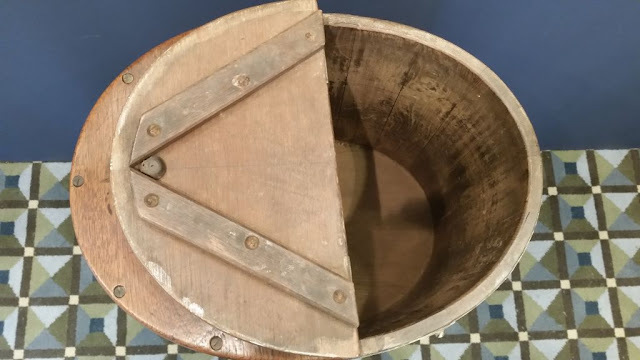 It was as though Keith’s instinct connected with the house and willed the FB Bruwer on the kitchen door to be the maker of ‘waterbalies’, the one thing he really wanted to restore to the house. This one description of a lot number at an auction, told us so much of the history of the house. Clearly there had once been such a ‘waterbalie’ in the house. This original must have succumbed to age and use. The brass plaque removed, and for some nostalgic reason fixed to the door. If F B Bruwer was connected to the house in any other way, we may never know. His name is not reflected in the ownership records of the property. What we do know is that the house predates the canal (completed in 1906). A time when the ‘waterbalie’ would have been the only way of having fresh water in the house – a time before the advent of running water. I sent the information to Keith who was understandably excited. It was decided there and then that the ‘waterbalie’ had to come home. 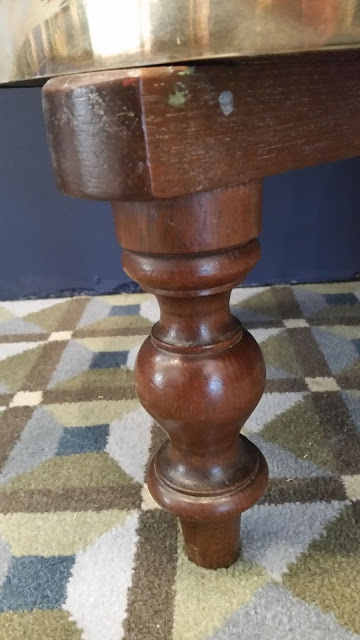 Not only was it the one item he yearned to include in the restoration, but it was one made in the valley and quite possibly not unlike the one which had once been in the house. I started searching for information on F B Bruwer. It led me to Estienne Bruere who was born in 1655 in Mer, in the district Blois in the Loire Valle of Orleanis, France. Fleeing religious persecution, Estienne boarded the ‘Voorschoten’ that sailed for Cape Town on the 31 Dec 1687 from Delftshaven, Zeeland (Netherlands). The Voorschoten arrived at Saldanha Bay (on the West Coast of South Africa) on 13 April 1688. Governor Simon Van Der Stel sent the Jupiter to fetch the Huguenots. It arrived in Table Bay on 26 April 1688. Among the 192 people on board were 22 Huguenots and the bachelor, Estienne Bruere. Estienne was a wagon builder by trade. Estienne started using the Dutch version of his name Steven and the Bruere became Bruwer. At the age of 25 in 1690, Estienne married the 16 year old Ester de Ruelles. They had no children together. Ester died in about 1701. Estienne then married Susanna du Puys on 19 February 1702. They had six children together. In 1730 Estienne started farming on the loan farm De Zandrivier near Rietfontein better known as Willemnelsrivier (in this valley). This farm is still a Bruwer farm. To find F B Bruwer was not easy. After requesting information on a genealogical site, I was informed that the only FB Bruwer found in South Africa, was a Francois Bartholomeus Bruwer. He was born on 26 September 1856 and died in 1932. He is from the Daniel Bruwer line and he married Aletta Johanna le Roux. Here is a possible connection to the property. The house was owned by Gabriel Petrus Jacobus le Roux in 1928. Perhaps Aletta was his sister? The dates for FB Bruwer corresponds with the period that he was making the ‘balies’. The maker stamp on the Towerwater kitchen door looks older than the one on the ‘waterbalie’. With the latest information firing me on, I went to the auction to bring the ‘waterbalie’ home. As with all previous auctions Keith and I discussed a fair price for the chosen item. Normally we agree on one price but sometimes we differ depending on the importance we each ascribe to the item. With the ‘waterbalie’ there was an auctioneer’s lower and upper estimate. With that context we then had to determine how high we were prepared to go with our bid. On the auction day, I went prepared with a preferred price, my highest price and then Keith’s highest price. His was higher than mine as he clearly wanted it more. Five items away from the ‘waterbalie’ adrenalin was rushing through my veins in excited anticipation. I imagine this is what a big game hunter must feel like as he gets his prize animal in his crosshairs. Finally bidding opened for lot number 351. I waited to see what the other bidders were going to bid. I was surprised to hear only one bid and before it was about to be knocked down. I raised my number and entered the bidding. The bidding was quickly rising in obscene denominations per bid. At the start, I imagined carrying the waterbalie to the bakkie confident in my bidding. A little later I could imagine Keith polishing the waterbalie while I was still confident in my bidding. A brief moment later the images were starting to fade as I switched over to Keith’s top price. Every successive bid was a swipe of the eraser to the images in my mind. Finally I bowed out, defeated and deflated. I could not bring the ‘waterbalie’ home and it was not to be Towerwater’s. But the story is Towerwater’s. 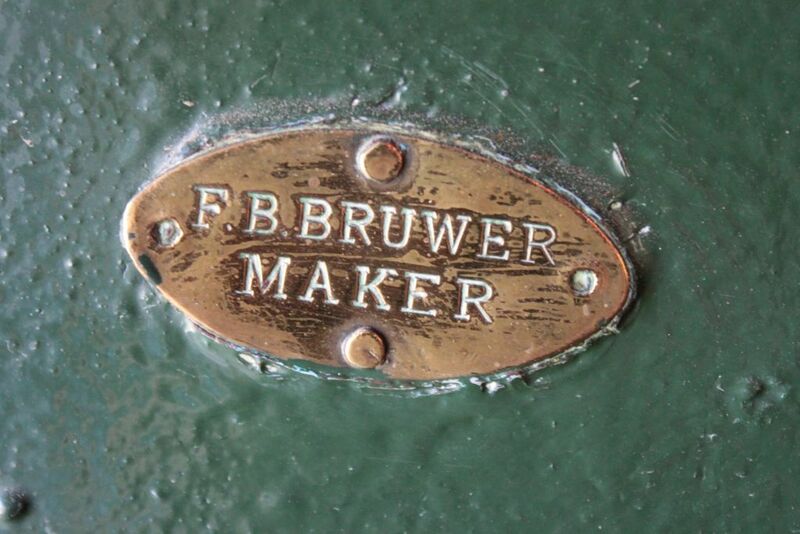 We now at least know the origins of the brass plaque with the FB Bruwer maker’s stamp on the kitchen door. 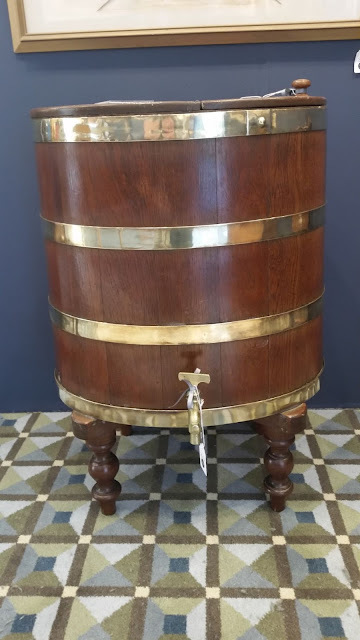 There will be another auction and there will be another ‘waterbalie’ made by F B Bruwer. For now I will be patient and listen for the next story to be told by this amazing house. Wow, what a great story. Thanks Thys I really enjoyed this one. Sorry about the waterbalie. Thank you, we missed this waterbalie but hopefully there is a second chapter to the story. Dankie..Thys...wat n jammerte...nogtans n deel van die legkaart wat voltooi is..Tower water is En bly n juweel. Dankie, net tyd sal leer of daar 'n FB Bruwer waterbalie vir Towerwater is. Ja nee, Thys, as mens by die Strauss & Kie veilings wil bie moet jy baie diep sakke hê! (Ek praat uit bittere ondervinding! )As Scott Fitzgerald observed; "The rich are not like you and I". Ek stem saam met jou Tertius. Ek moet maar berus by die feit dat ek ten minste probeer het. Hallo Thys, het jy die Bruwer Familie geschiedenis boek van Vincent Bruwer geraadpleeg? Ek het een in die kas en sal vanaand bietjie draardeur werk. Fanus Bruwer..ook FB...maar nie die maker van die balie! Hallo Fanus, nee ek het meeste van die familie geskiedenis aanlyn gekry en van mense wat die Bruwer familie navors. Ongelukkig is daar sekere familie lyne wat nie so deeglik nagevors is nie. Baie dankie, dit sal interresant wees om te hoor wat jy vind. Was so dissapointed at the end. Not sure if I could be so disciplined...... also interesting that there was someone else willing to pay more..... wonder why? Another story there, maybe? Cheryl I was tempted to see how far I can push it but at that stage it was already double the top estimate. 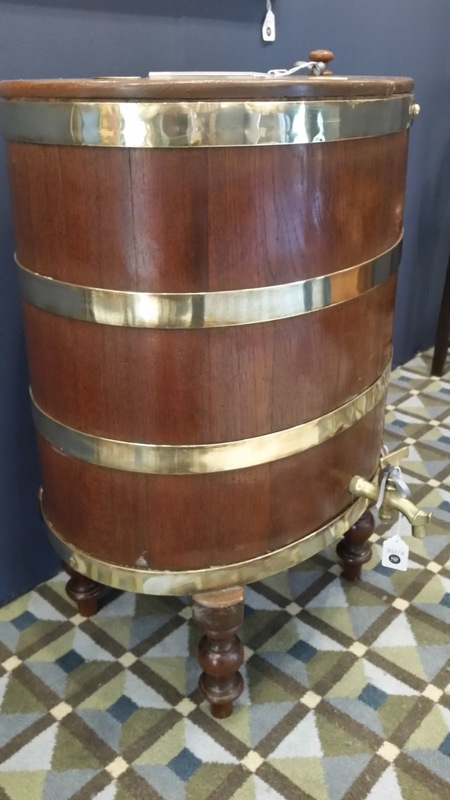 I am sure it was a collector but I am sure Towerwater will have a FB Bruwer waterbalie one day and maybe one with the older maker stamp that is the same as the one on the door.